And make it nice this time. Whether or not the newly crowned champions of the NFL decide to make their ceremonial White House visit, we would like a preemptive chance to upscale the spread just a bit… Call it a preventative measure on behalf of the nation to bypass what might become yet another meme. (You know what we’re talking about). It could certainly be argued that the idea of serving guests at one’s home fast food is the epitome of “American,” whether we want to admit it or not. We really have perfected fast food—and eating it. Indeed, most of us have more than one childhood memory of devouring Happy Meals and the like. You know, comfort foods. You don’t have to be Bill Belichick to put two and two together here: Familiar + Delicious = Crowd Pleasing. But given the notoriously disastrous collegiate champion’s meal served by the White House in January, how does Trump “make it nice” this time? The short, easy answer: Homemade Fast Food. The longer version: Reimagine and remake the iconically American fast food dishes we all know with better ingredients at home. Below is a list of our favorites, presented by fast food chain. We’d like to think this is more than just a gentle suggestion for the White House (who probably won’t read this). We’d also like to think of this as a fun idea for your next tailgate, game day event, or White House-themed dinner party. If we’re going to have fast food, Wendy’s stacks up pretty high on our list. (One writer on our Hungry Fan team really loves Cookout, so Wendy’s is the winner in his book because it’s the closest he’s gotten to his fast food chain mistress). The cream of the Wendy’s menu rises to the top in two forms—one hot and one cold—the spicy chicken sandwich and the Frosty. Both are delicious and iconic. But making them at home would seriously elevate them significantly. Take note, Mr. President. Check out a recipe for a delectable spin on Wendy’s Spicy Chicken Sandwich here. And don’t miss a recipe for a homemade Wendy’s Frosty here. KFC is the best bench player of all time. It’s 100% of the time a huge cheat day meal, but since it’s so delicious we’re always inclined to offer ourselves more cheat day meals each month [than we should]. The top two items? The Double-Down and the coleslaw, hands-down. The coleslaw is better than grandma’s (sssh) and the Double-Down is so purely American, it’ll turn your arteries turn red, white, and blue. So be a good American and get down with these. Get a copycat KFC coleslaw recipe here. Check out a recipe for an amazing homemade take on KFC’s Double Down here. It’d be so easy to make a border wall joke here, we can barely hold ourselves back. But we try not to get political here at Hungry Fan so instead, we’ll tell you how many times we’ve collectively eaten Taco Bell after midnight. Well, it’s many. (Meanwhile, how excited are we for the newly opened Taco Bell cantinas that serve adult beverages!?! Apparently we’re not alone—they’ve been packed here in NYC). Do know you how insanely good homemade Taco Bell items are when you actually make them yourself? Damn good. Granted, it’s always easier to just order these items at the drive through. But trust us, if you make these from scratch, your hungry guests will devour them in seconds and tell stories about the meal for years to come. We found a delicious recipe for homemade Taco Bell Nacho Fries BellGrande here. You won’t want to miss a fun spin on Taco Bell’s Mexican Pizza, which you can find here. The most popular chain in America right now is Chick-fil-A (which, by the way, finally made it here to NYC in the last couple years, thank the lord), but it’s not because of their politics. It’s because of CFA’s delectable chicken and their insanely tasty array of sauces. (We are partial to the original, the BBQ and the honey mustard). We highly suggest whipping up a ginormous batch of their nuggs for friends and guests on game day. Ginormous because you’ll inevitably eat a s*%t ton hot out of the oven before they even make it to anyone else’s plates, so you’ll need massive excess. And don’t forget the sauce. It’s the icing on the crispy chicken cake. And who doesn’t like cake? The recipe you need for copycat Chick-fil-A Nuggets can be found here here. The following link is a recipe for a rendition of CFA’s main sauce, complete with crack. Just kidding. Copycat sauce here. The sandwich that started it all.. Well not really, but the Big Mac has become an icon—if not Mickey D’s flagship burger. How many of you can recite the commercial jingle with all the ingredients? We see you nodding… And boy oh boy, the first time you make these for a game day party, you will undoubtedly leave a lot of people feeling like they’re kids again. Just imagine if this guy ate 30,000 of these homemade Big Macs instead! He might be president. 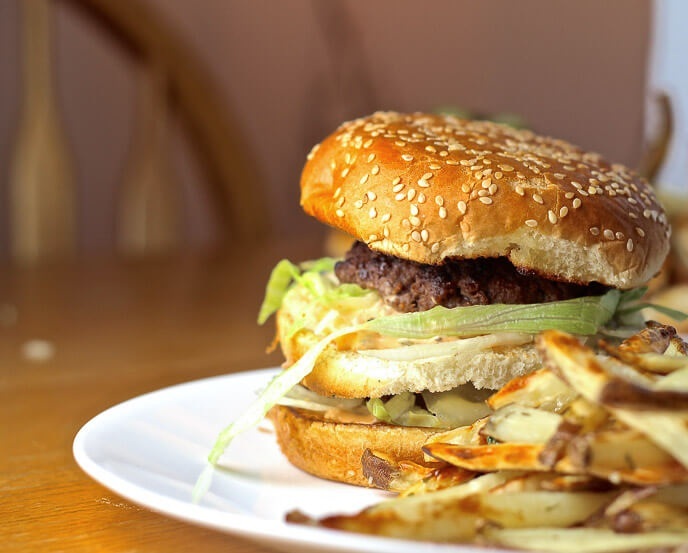 Check out this recipe for a spectacular spin on the McDonald’s Big Mac here. If you’re looking for how to make the mysteriously magical special sauce, click here.